MANILA - Nurturing a reputation as an ethical company is key to attracting millennials into choosing products and services from a particular firm, officials of insurance provider Axa said Thursday. AXA chairman Denis Duverne said the younger generation "is looking for a company with a conscience," which is why his company has been carefully choosing its investments recently. Duverne said among the issues that concern millennials are climate change and health. "We have a long tradition at AXA on being worried about climate change calling on governments to do more in that space," Duverne said in an interview with ANC's The Boss. This led the company to divest from companies involved in coal in 2015. "We've expanded that to getting out of oil sands. We no longer invest there and no longer insure companies that are active there," Duverne added. 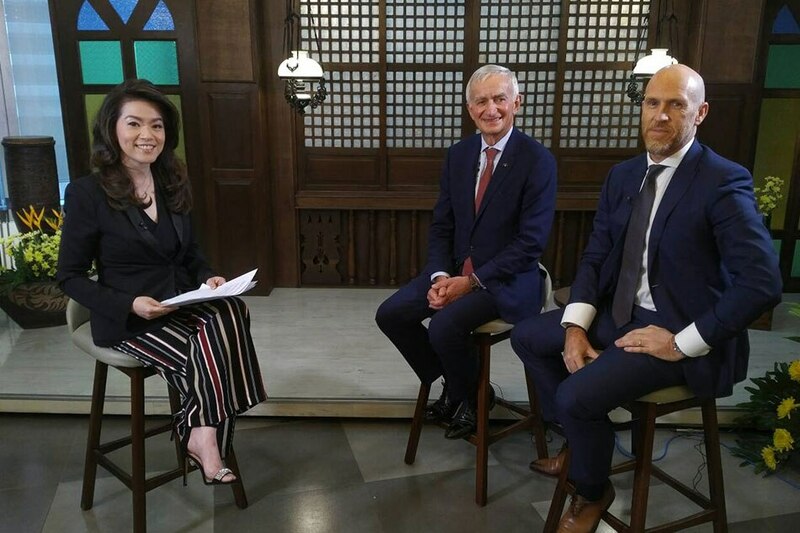 Cathy Yang talks with AXA Chairman Dennis (middle) Duverne and AXA Asia CEO Gordon Watson (right). Divesting from coal turned out to be the right decision, in hindsight, according to Duverne, as several months later a lot of companies also dropped their investments in coal. This caused several coal firms to file for bankruptcy. Besides coal, AXA also "got out" of tobacco, and no longer invests nor insures any tobacco company. Gordon Watson, AXA Asia CEO meanwhile said that Asia represents an incredible opportunity for insurers because of the region's fast growth and what he calls a "massive protection gap." Watson said that of the next 1 billion people who will move into the ranks of middle class, 90 percent will come from Asia. Despite this, insurance penetration remains low in many countries in the region, including the Philippines because of what he calls the "sachet economy," where people avail of products and services in small amounts and only when needed. "The sachet economy does make it more difficult. You live for today, instant gratification, but it's not the best value for money," Watson said. He said it was a challenge for insurers like AXA to educate emerging customers into buying protection. "You need exciting ways to engage millennials," he said. Firms also need to be more creative to reach out to the younger generation, and AXA does this via a hybrid strategy of face to face meetings enabled by digital presentations and social media.